Whether you are visiting San Diego for a short weekend or a long vacation you will find there are hundreds of great things to see and do. San Diego has 34 miles of oceanfront, 7 individual districts and 16 waterfront parks to keep visitors of all ages happily occupied. Attractions in this Southern Californian city include missions, museums, wildlife attractions, parks, festivals and boat trips so there is sure to be something to suit every visitor. 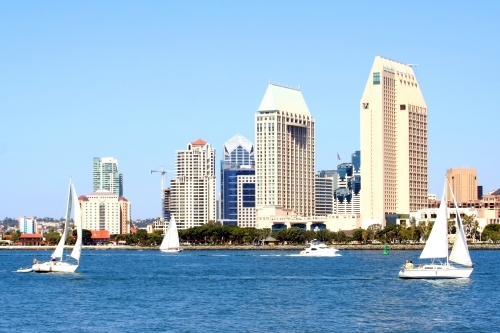 Here is our top 10 pick of the best things to see and do in San Diego. If you want a day out that won’t cost the earth, head for the lovely Balboa Park, the largest cultural park in the US, located in Downtown San Diego. Ride the carousel which offers a brass ring game for riders on the 5-minute ride, enjoy the 1,200 acres of lush green gardens or visit one of the 15 museums. On Sunday afternoons the park puts on a concert of live music at the Spreckles Organ Pavilion. The huge organ has 4,530 pipes which are brought to life by the resident organist, so take a rug and a picnic and enjoy the free entertainment. Most people need no introduction to SeaWorld’s amazing attractions which includes thrilling rides, excellent exhibits of marine creatures and entertaining performances by sea lions, dolphins and killer whales. If this is a return trip, book the excellent one hour behind-the-scenes tour. SeaWorld guides take small groups of visitors around the nursery pools, dolphin training areas, infirmary, training areas and shark laboratory. As well as seeing places not open to general visitors, the guide is full of interesting information and will answer all your questions. Don’t forget to take a disposable waterproof camera for those Shamu soakings! 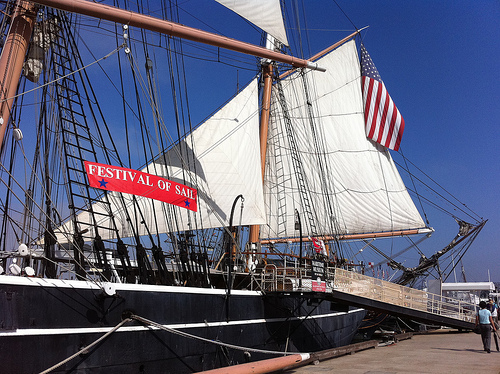 Enjoy the breeze as you stroll around the charming shops along San Diego’s waterfront. 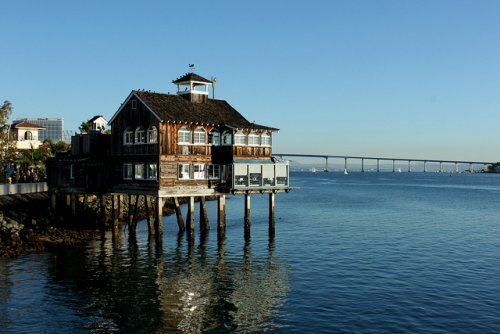 The outdoor setting has clothing and souvenir shops, art galleries and cafés with beautiful views across San Diego Bay. Seaport Village has something for everyone such as the unusual Del Sol store where everything changes color when exposed to sunlight – ideal for the sunny Californian climate. Altogether there are 50 neat shops for browsing and 17 eateries so you are never far from an ocean-front patio and a long cool drink. There is nowhere more pleasant to be than out on the water in San Diego Bay. Rent a boat for the day, hire a wave runner or book a boat trip around the bay. One of the most romantic and relaxing times to be out on the water is at sunset. There are a number of marinas around San Diego harbor which offer sunset or dining cruises each evening on a luxury yacht. 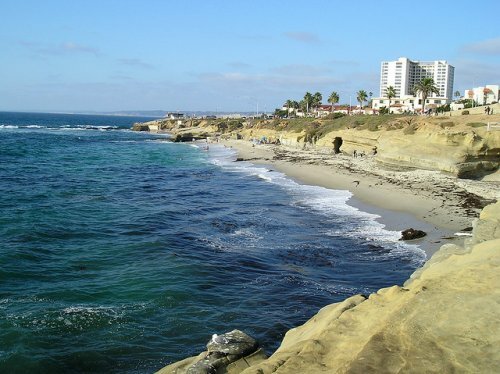 La Jolla is considered the jewel of San Diego with its European-style seaside village atmosphere. Stroll around the small shops and restaurants, take a bike ride or fly a kite on the lovely beach. Coast Boulevard is the perfect place to see (and hear!) sea lions and seals frolicking or watch pelicans flying low over the waves on the lookout for a fish to catch, toss back and gulp down. Take a swim in the famous cove or explore the depths of the famous La Jolla Cave – if you dare! The best place to learn about San Diego’s interesting history, dating back to when it was part of Mexico, is to travel to one of the 21 missions which were built along the coast of California between 1769 and 1823. 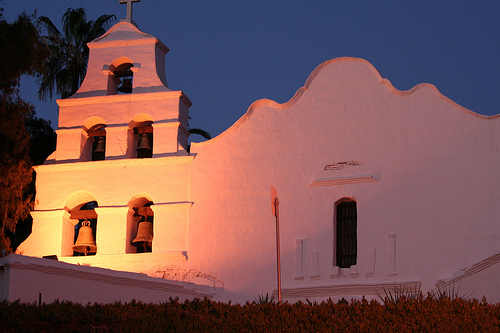 The first to be built was the Mission San Diego de Alcala and it has five restored bells in the lovely Spanish-style basilica. Mission San Luis Rey is the largest and offers visitors plenty of historical and educational information in an unforgettable setting. Ship ahoy! History of a different kind awaits visitors at the Maritime Museum which has one of the best collections of restored ships in the world. From the 1863 Star of India sailing ship, the oldest active iron-hulled sailing ship in the world, to the 1898 steam ferry Berkeley this fine collection also has a 1904 steam yacht, the state’s official tall ship California, a 19th century revenue cutter and a magnificent replica Royal Navy frigate from the 18th century. This leading San Diego attraction has a superb layout and has well-established coral reefs from all over the world which are home to amazing colorful fish, sea horses and other marine life. The Tropical Seas Gallery is packed with poisonous lionfish, giant clams and a host of other underwater creatures. 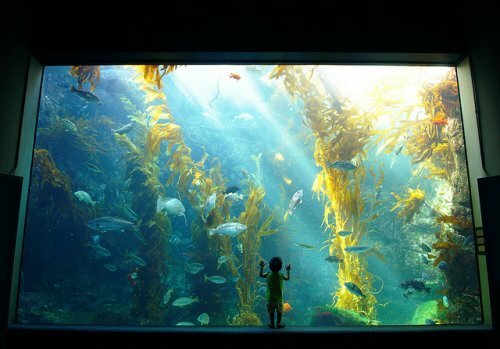 The Aquarium’s main purpose is to educate visitors on the importance of the ocean. Their excellent exhibits make conservation fun with tide pooling, snorkeling, whale watching and walks along the pier. You can also visit the Scripps newsroom and help forecast the climate for 2050. San Diego is one of the best places to go deep sea fishing, and it’s not just for the boys. 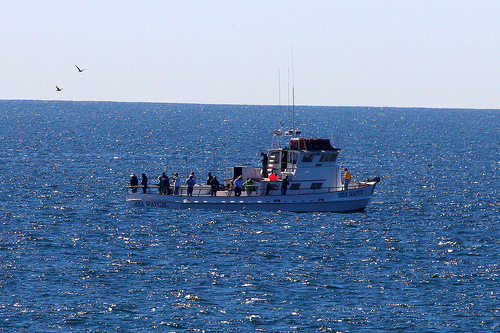 The climate is warm and the sea is usually calm on the trip out to the Coronado Islands off the Baja Coast. Book a half day trip including tackle and bait and you are sure to have a memorable experience. The pleasant boat trip out to the kelp beds is a most enjoyable way to see some of California’s scenic coastline and the friendly crew is always on hand to help beginners. Most visitors catch several reef fish which are filleted and bagged for you on board, ready for the frying pan. San Diego’s helicopter tours offer an exciting experience and a great bird’s eye view over La Jolla, Mission Bay and even SeaWorld. Travel high above the beaches, see boats and dolphins out at sea and enjoy the short but memorable ride. If that sounds a little tame, consider taking a Barnstorming Adventure trip in a restored 1920s biplane or even take the chance to fly the plane with dual pilot controls on a sky tour with Air2Air Charters. With so many attractions to enjoy in San Diego, your first visit will certainly not be your last!